The Yoga and Ayurveda Teacher Training course offers an extensive Yoga Teacher Training curriculum and in addition an understanding of the complementary role Ayurveda plays in achieving good health. This Preventive Healthcare Professional course comprises of practices and teaching methodology from traditional Hata Yoga schools like Satyananda yoga (Bihar school), Ashtanga Yoga (Vinyasa) and also modern schools like Iyengar. Our courses blend the traditional Indian wisdom from Yogic texts like Patanjali’s Yoga Sutras, Hata Yoga Pradipika and Ayurvedic text like Astanga Hrdayam with modern anatomy and teaching methodologies to provide a broad understanding of yoga in therapy, lifestyle and diet. This module focuses on nuances of various asana, pranayama and pratyahara practices. Over 50+ classical asanas are covered in depth to provide students understanding on alignments, breath, benefits, contraindications and modifications. This module covers the essence and wisdom of Hatha yoga philosophy from the authentic sources like Patanjali's Yoga Sutras, Swami Swatmarama Hatha Yoga Pradipika and contemporary approaches such as Satyananda Yoga (Bihar school of Yoga), Ashtanga Vinyasa (Mysore school) and Iyengar Yoga. This module covers the philosophy and practices of Ayurveda that complement Yoga practice. The practical aspects of food, lifestyle and detox extracted from the ancient wisdom of Sushruta and Charaka are shared with the students. This module focuses on basic understanding of Human Anatomy and Physiology. The knowledge of how different body systems are integrated, their strengths and limitations help students to become more conscious of their own body and mind. This module is all about sharing one’s experience and wisdom with fellow practitioners and is designed to equip the student with both modern and traditional teaching methodologies. Non-contact hours includes personal sadhana, observation classes, seva and teaching hours. The course comprises of practices and teaching methodology from traditional Hata Yoga schools like Satyananda yoga (Bihar school), Ashtanga Yoga (Vinyasa) and also modern schools like Iyengar. The first module focuses on strong fundamentals and is based on traditional format of yoga education as practiced in India. Abhyasa (practice), Adhyayana (research) and Sadhana(mastery) are the 3 core training components of the shaala and forms the basis of all its courses. This module builds deeper awareness of your strengths and challenges. The second module is all about effectively communicating one’s experience and knowledge of the practices with aspiring students. This module blends modern and traditional teaching methodologies. Yoga has been evolving, so are the teaching methodologies; discover what it takes to be an inspiring yoga teacher, a life coach. 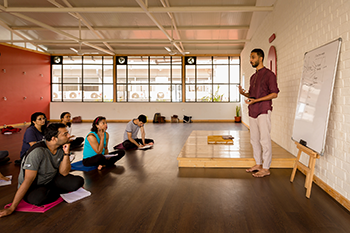 Our course equips you with the knowledge, skills, techniques and support system to become an effective Yoga Teacher, it also provides valuable knowledge thats been collated from many reference texts of Ayurveda enabling you to provide a more wholesome and rounded approach for your students and yourself. The course gives you the building blocks required to start on the journey of good health and well being, it teaches you how to impart this knowledge to others. On a whole you will learn what it means to be on the path of Yoga, How Yoga encompasses all aspects of life, a structured approach of moving from Gross to Subtle . Lifestyle and food habits to suit your needs in accordance with Ayurveda. Self learning to what it takes to be a teacher . Adapting Yoga and Ayurveda to the current lifestyle and urban setting to provide a much required sense of well being. Along with this company of like-minded people and tools to nurture yourself. The course is just the beginning of a lifelong journey of self discovery and acceptance. 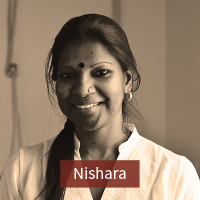 It was in San Francisco in 2008, that Nishara conducted her first Yoga class, at the Sivananda Ashram Centre. She was initially nervous, but “being an Indian, with the ‘exotic’ looks paid off.” While she used to go to the Gym and also do Aerobics, there was something missing. She used to work in Public relations, and soon realized that it was not really her calling. “A corporate job was not my cup of tea”. 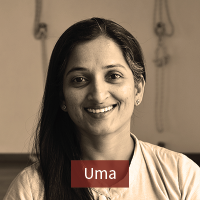 She started learning Yoga in 2005 and started teaching since 2008. She specializes in Hata and Sivananda. She has also completed her Advanced Teacher Training Course (ATTC) at the Sivananda Ashram at Neyyar Dam. Her shortness of breath and carpel tunnel syndrome are both in check with the regular practice of Yoga. She truly embodies the youthfulness of Yoga, as no one would believe her age, even if she told you. “Sometimes you have moved so much that it takes a while to understand when that happened; the very first experience of Yoga (Asanas, now that I can differentiate Yoga is not just Asana practice) was in Bangalore in a form called Artistic Yoga. Loved it, as I was able to do many of the things asked by the instructor. 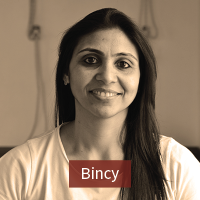 Before Yoga I tried free flow dance/aerobics and the likes but this experience was more interesting for me.” Rubina has an MBA with a Marketing specialization and worked in Integrated Marketing Communication. Work has always been very enriching for her although this realization was only after she started practicing Yoga. Getting to combine Yoga (practice/teaching) with her academic qualifications and work experience was like a combo delight for her as she has worked at a1000yoga for more than two years handling Marketing and Communications. 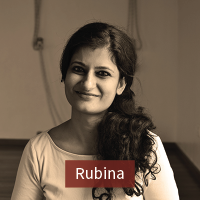 Rubina practiced Yoga on and off since 2006 but seriously started learning in 2011 and has been teaching since 2013. She loves the Hata style and also imbibes a few of the therapy elements (learnt from self experience of severe back and shoulder condition) depending on the practitioner’s needs. For her a practice session is something that can flow with ease, from posture to posture with breath, to bring awareness of your whole existence. 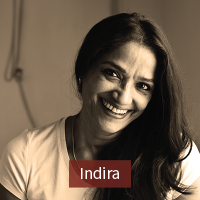 Rubina likes gardening and obsessively cleaning her home, reading and spreading the joy of Yoga. 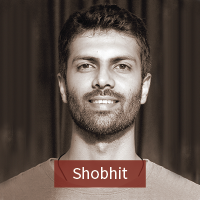 Shobhit’s first yoga experience was in 2010 and there has been no looking back since then. He was always intrigued by the science & philosophy behind this ancient art, and pursued a Hatha Yoga teacher training under the guidance of Pradeep Sattwamaya. As he progressed on his journey, his interest in psychology & self-inquiry guided him to do a teacher training in Yoga Nidra with Swami Yogaratna Saraswati. He feels blessed to have been mentored by his teachers, who are both disciples of Swami Niranjanananda Saraswati (Satyananda Bihar Yoga tradition). 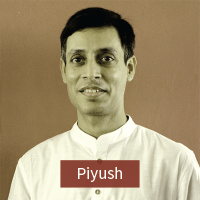 Shobhit specialises in Advanced Yoga Nidra & Pratyahara practices. He advocates a holistic approach of movement, breathing, mindfulness & introspection. 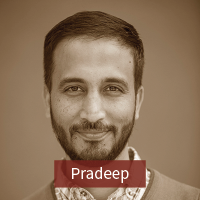 He is also a UX Design Consultant and studies human behaviour to solve problems through design. His primary passion is teaching yoga, but he enjoys the balance between the two.